A Cardboard Problem: Bip This: The missing link arrived. 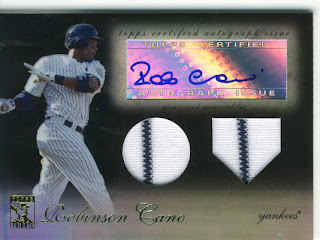 Crazy girl finally finished the 2009 Topps Tribute mission she set out on. Though it cost more than I initially thought it might, it still doesn't even come close to the cost of a box, or half a box for that matter. I picked the swinging version of the card for those of you just tuning in (and you shouldn't be just tuning in because we are fun). And because I can, I'm going to make a rainbow of this. 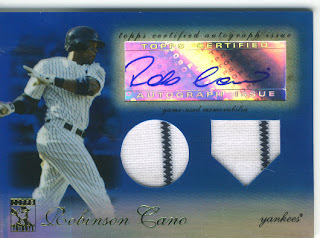 My favorite autograph out of the 4 cards is on the black one, least favorite is sadly the gold one. 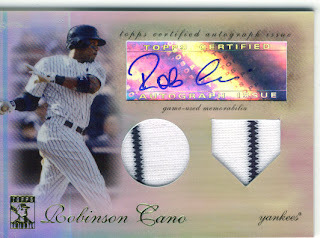 This is probably one of the cooler things that I have gone after in recent months as far as Cano goes and I am very happy with my little set from Tribute. I also want to note that for some reason the swinging version seems to sell for more money than the throwing one. No idea why, and I could look into it but I'm lazy. Not to mention that they are serial numbered the same way so I can't imagine there is really a good reason. Anyone else go after a player and do the same thing? I have a few Kearns rainbows like the one you have. Mainly all Leaf since Donruss did so many. That's a pretty sweet collection of parallels. I pulled a Kearns gold card that I don't believe was claimed yet. I have to double check that post to make sure. Chasing the rainbow is awesome. Nice work. 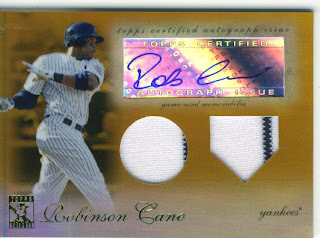 Cano's signature kinda looks like it could be Bob Costas.